Nigeria’s Hottest Artiste at the Moment “DAVIDO” is set to embark on his 14 City USA TOUR 2017. 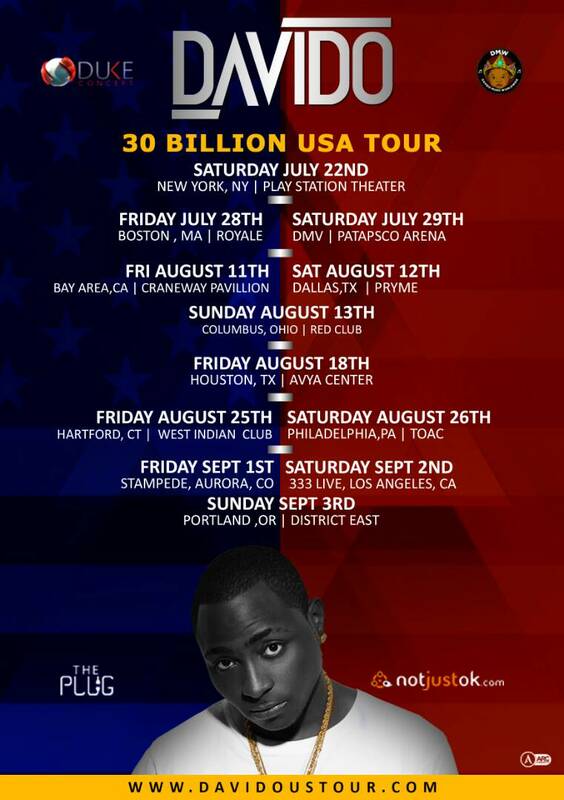 Which is theme ’30 BILLION WORLD TOUR – USA”. The tour which is powered by a renowned USA promotion firm DUKE CONCEPT LLC is set to kick off in New York this Saturday at PLAY STATION Theater. Davido is expected to bring on many special guests which still remains a secret at the time of this publication. The Anticipation is Very High in New York as it is his 1st show after he performed there 4 years ago that attracted over 4000 people. The Tour is expected to also extend to Boston and DC on July 28th and 29th respectively, a stop in Dallas on August 12, Houston August 18, and finally end in Portland, Oregon on Sept 3rd. For more info and Ticket Purchase for any of the shows visit www.davidoustour.com or email info@dukeconcept.com.